Since 2017 the European Union Agency of Law Enforcement Cooperation, better known as Europol, has been crowdsourcing parts of or heavily censored photographs, related to child abuse crimes in their “Stop Child Abuse – Trace an Object” campaign. Classifying IIOC for both Mobile Phone Forensics and Computer Forensics is a daily activity when it comes to Digital Forensics. Within two weeks after the start of their campaign Europol received 10.000 contributions from the public. Bellingcat, among many others, shared this campaign on the crowdsourcing platform Check. Many followers of this campaign have helped by identifying objects and/or geolocating photographs. The location of a photograph in a hotel room was proved to be taken in a hotel on Mauritius within 48 hours after Europol shared the photograph on Twitter. Europol published a press release on the success of their campaign earlier this year and mentioned that out of 70 objects, 25 of them were identified to one country or else to a reasonable number of countries of production and on 1 June 2018, one year after the start of the campaign, a press release describes that Europol received 21.000 tips and more objects and countries of production were identified. Another press release from October 2018makes clear that eight children have been identified and one offender has been arrested because of citizen efforts. Europol shared new images on their website and via Twitter on 15 October 2018. These were mostly of objects that need to be identified, but there were also a few photographs that were taken outside and are possible to geolocate because of recognizable landmarks. Two of these photographs, taken from a roof of a building, show concrete buildings, and were presumably taken in an Asian city. According to Europol, a child was sexually abused in this city. Europol’s investigators need the location of the photograph to be able to trace the abuser and save a victim. The photographs are heavily censored, because of the sensitivity of the material. 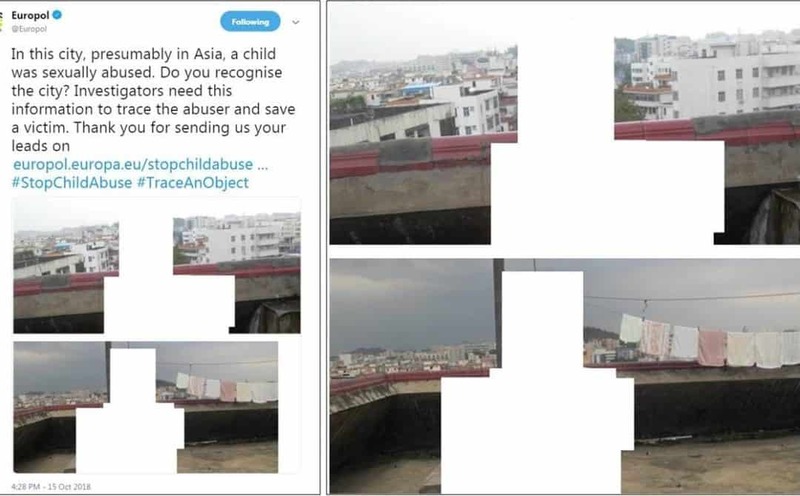 Europol’s tweet from 15 October 2018 (left) and the two photographs taken from a roof in an Asian city (right). At first glance, the photograph doesn’t seem to contain many recognizable landmarks. No text is displayed on the buildings and the concrete architecture of the buildings only indicates that the photographs have been taken in an Asian city. Many Twitter users responded to the tweet and mentioned a former Soviet Republic, Malaysia, Philippines or Indonesia as possible locations where the photographs were taken, yet the majority of the responses indicated Southern China as the most likely location. Twitter user “Bo” contacted Bellingcat and mentioned the architecture especially shows similarity to the city of Shenzhen in Southern China. Bellingcat responded to Europol’s tweet with this information, included a photograph of similar architecture and an overlay image of the two photographs, mentioning a blue road sign and a structure similar to a satellite receiver on top of a building visible in the photographs. Sixteen days later, on 31 October 2018 Twitter user Olli Enne from Finland geolocated the exact location of the photographs in the Bao’an district of Shenzhen in Southern China. According to Olli, the photographs have been taken from the roof of a building with coordinates 22.722917, 114.053194 and, he explained, several buildings and a hill in the photographs match the buildings visible in satellite imagery. Also, a view line across a building with a blue roof to a building with arch shaped windows in the distance lines up with the view line in satellite imagery. In later tweets, Olli explained that he searched in Shenzhen and other major cities in China for several hours, looking for little green hills and road shapes, and that he draw a map how the area would look on satellite imagery. Tweet from 31 October 2018 from Olli Enne (left) and the image that explains the geolocation of the photographs (right). The geolocation of the photographs could not be immediately verified by Bellingcat, as it wasn’t easy to match the buildings of the photographs to the buildings visible in satellite imagery, mainly because of the distance from the location where the photographs were presumably taken to these buildings. Yet due to street view on Baidu maps, a Chinese web mapping system, we were able to verify that Olli’s geolocation is a perfect match. A white building visible on the left side in one of the photographs shows strong similarity to a building visible in a 2014 street view on Baidu, just as a white building with several balconies visible on the right side in one photograph shows a match to a building visible in an older street view as well. Also the buildings with red and orange tiles on the roof from the photographs, as well as a blue road sign, are visible street view. A hotel further away, the building with arch shaped windows and several buildings at the end of the road near a hill with trees, one of them demolished in 2017, are all visible in recent or older street views as well. Street view shows a white building with three antennas on the roof, similar to a white building with what looks like three antennas on a roof in the photographs. Overlay image of Europol’s photographs with enhanced contrast. The distance between the buildings on the left and on the right side, as well as a blue road sign, indicate there’s a bigger road in between these buildings. A smaller street along the white building with balconies crosses this road. Several buildings and also the blue road sign from the photographs are visible in recent or older Baidu maps street views. Also, the building from where the photographs were taken can be geolocated because of the red tiles on the eaves. Street view from 2014shows red tiles and even a pole on the roof, which is similar to a pole visible in one of the photographs. The location from where the photographs were taken is the roof of a building visible in Baidu street view (red rectangle). Red tiles on the eaves and also a pole on the roof at the same location as in one of the photographs are clearly visible. A Google Earth 3D view of the building the photographs were taken from in the same direction as in those photographs shows the same mountainscape. Particularly the shape of the mountain on the left side of the photographs is very similar to the shape of the mountains in the 3D view. A smaller mountain with a relatively high peak is more difficult to spot, but following a view line in the photographs from the location where they were taken in the direction of that mountain shows the same buildings in the 3D view that are visible in the photographs in that view line. Also the partly visible small green hill at the end of the road is clearly visible in Google’s 3D view. Google Earth 3D view shows the same mountainscape and the nearby small green hill as visible in the photographs (marked in red rectangles). The green lines are the view lines that show the area that is visible in the photographs, while the yellow line shows the view from the building where the photographs have been taken to the smaller mountain with high peak. Because the buildings in the photographs show more similarity to the same buildings in older street view captures, it is clear that the photographs were not taken recently. A 2017 street view shows one of the buildings was even demolished and the buildings near to the location where the photographs were taken have brown netting, i.e. protective constructions for air conditioning. A 2014 street view capture shows GSM antennas on the white building on the left that are not visible in Europol’s photographs. Recent street view shows many GSM antennas and satellite receivers in the area, while the Europol photographs only show one satellite receiver and three antennas. Satellite imagery tells us the photographs had to have been taken after September 2002, as in the photographs one building clearly has a blue painted roof, which is not visible in satellite imagery from September 2002, but is visible in satellite imagery from February 2008. Also, two buildingsvisible slightly in the distance on the right side in one of the two photographs are not visible in 2002 satellite imagery, but are visible in 2008 satellite imagery. A factory and other tall buildings, visible in the photographs behind the building with arch shaped windows were not constructed before February 2003. Satellite imagery from November 2013 shows the construction of a high rise building that should be visible in one of the photographs if they were taken in or after 2013. However, a smaller building is visible in the photograph, but the high rise building that is standing behind it, as visible in 2016 street view, is not visible in the photograph. It is very difficult, perhaps even impossible, to say exactly in which year the photographs were taken. The roughest estimation is between 2003 and 2013, so it’s most likely they were taken around 2008. Left: two buildings visible on the right side in one of the two photographs that have been constructed after September 2002. Right: A high rise building constructed in 2013 that is not visible in Europol’s photographs, but the smaller building in front is visible. Satellite imagery of the area visible in the photographs from 2002 compared to imagery of 2008: a blue painted roof (blue square) and two buildings (green rectangle) from the photographs are visible in 2008, but not in the 2002 satellite imagery. The next part describes the initial research of Bellingcat and others, that eventually helped Olli Enne in finding the exact location. This initial research specifies many details, which mainly are added to show our method of working, but also to show which exact steps were needed to come to our results. Bellingcat’s research started when Twitter user “Bo” shared a video filmed in Shenzhen, China, showing very similar architecture as in Europol’s photographs at the 4:17 time mark. Important note: The people in the video have no relation at all to Europol’s campaign, the video is just meant as an illustration of what the architecture in Shenzhen looks like. “Bo,” who is very involved in Europol’s campaign, has cooperated with Bellingcat for this cause and is a member of research collective Serendip, which played an important role in solving one of the biggest child abuse cases in the Netherlands. A screenshot from a video filmed in Shenzhen, China, showing very similar architecture as in Europol’s photographs. The building on the front from the video has similar windows as a building on the left side in one of the photographs. Also, the smaller buildings in the area with red and orange tiles bear similarities to buildings visible in the photographs. The video doesn’t give much clues as to the several locations where it was filmed, certainly not for people who are not able to read Chinese. One part obviously is filmed in Shekou, a modern harbour area with many high rise buildings and clearly not in the same location as the older buildings. A Cantonese restaurant, visible shortly before the part featuring the older buildings and filmed likely in the same area, is geolocatable for a Chinese speaker. However, text recognition with a OCR-tool didn’t work, because the characters are in a particular style and also not filmed in a straight angle. An earlier part in the video, on the other hand, shows a street with shops. At the wall on the side of one of the shops a small blue sign with a street name is visible, but the same street name and house number is also more clearly visible on the store sign itself. The colon after two characters indicates the name of the street starts after that colon. An aforementioned free online OCR-tool, NewOCR, can be used to recognize text in many languages. However, the tool is quite sensitive in a way that the text has to be straight and no other parts of the image can be included, the smallest deviation results in the tool not recognizing the text. After a few (partly) failed attempts, the tool recognized the text as 南岭东路49号, which (literally) translates as “Nanling East Road 49 number.” Google maps doesn’t display the correct location, but it seems to be the correct area. However, Baidu maps shows the correct location with a search for 南岭东路49 (without word “number”). The stores have changed between the street view date and the date the video was filmed, but it’s obviously the same location. Screenshots from the video showing a Cantonese restaurant (left) and shops on Nanling East Road nr. 49 (right). The name of the street including house number is marked with a blue rectangle and this part of the image was used to read the text with an OCR-tool. A short part of the video shows a drone shot from the area and suggests the Cantonese restaurant is one of the buildings visible in the drone shot. The area of the drone shot is found easily near to the location of the shops on Nanling East Road. Particularly, a building with a blue and white roof is very recognizable. Screenshot from the video showing a drone shot (left) and the same location on Google Earth (right). From here, the exact location of the buildings visible on 4:17 in the video is also not hard to find, as it is just a bit further south from the drone shot area. The high rise buildings visible in the video, but also the area in the video at 4:20 (showing a green edge and a small building with a blue roof next to a higher building) is visible in satellite imagery. A closer look at the part of video that shows the Cantonese restaurant at 3:43 shows the same green edge in the distance and the same buildings visible at 4:17. Bellingcat contacted a person living in Shenzhen about the location of the restaurant and the spelling in Chinese characters. This individual told us that the name of the restaurant is spelled 金沙湾茶餐厅, which translates as Golden Sands Bay Tea Restaurant. The restaurant is displayed on Google maps in the correct street, but the map doesn’t match the satellite imagery exactly. The map, in fact, moves the restaurant 500 meters to the east of the real location on satellite imagery. Baidu mapsshows the restaurant almost at the right location and displays a few reviews, as well as an older photograph of the restaurant. The address of the restaurant, 深圳市龙岗区樟树布新村一巷10, which translates very odd, is in fact the first alley on nr. 10 of that neighbourhood (Yushubu new village) in Longgang district, Shenzhen. The exact location marked by a red dot where the video is filmed from at the 4:17 mark: the buildings with similar architecture as in Europol’s photographs and the high rise buildings are visible to the east from the red dot. The green edge and small building with a blue roof are to the south-southwest of the red dot. The Cantonese restaurant is marked in an orange square. Unfortunately, no match was found between this eastern suburb of Shenzhen and Europol’s photographs, although the mountainscape in eastern direction seems to be a match. After finding many more areas in Shenzhen with similar architecture and mountain scapes, no precise match to the photographs was found. We realized that the chance to find the exact location in a city of 2000 square kilometers (compare it to London, with 1500 square kilometers) is like trying to find a needle in a haystack. At that time it was not even clear the location is in Shenzhen, as other major cities in the area like Dongguan, Guangzhou and likely many more cities in China have similar architecture. Yet the Bellingcat team found another clue that the photographs possibly were taken in a northern or eastern suburb of Shenzhen: a video filmed from a tram in Shenzhen shows a building with three antennas on the roof, very similar to what looks like three antennas on top of a building in one of the photographs. We also noticed many satellite receivers on the roofs of many buildings in the same area. By following the direction of the tram in the video simultaneously to the street view in Baidu we were able to find the exact location of the building with three antennas. In this area, we also could not find an exact match with Europol’s photographs, but we noticed again the similarity between the architecture of this area and the photographs. A few days later, when the exact location was found by Twitter user Olli Enne, we realized how close we were to the exact spot: 1.2 kilometer as the crow flies or a 20 minute, 1.5 kilometer walk. The tram in the video stops at Xinlan, which is even less than a kilometer from the exact photograph’s location. A screenshot of a video filmed from the Qinghu-Xinlan tram in Shenzhen shows three antennas on a roof of a building with a similar shape as a structure visible in Europol’s photographs and a satellite dish is also visible. A street view of the same area shows many more satellite dishes. This research shows that in a complex investigation tiny details can be very important. The architecture, the tiles with red and orange colors, the blue roof and the mountainous area narrowed down the research to Southern China. Details in a video lead us to an eastern suburb of Shenzhen with similar architecture. Another video shows us GSM antennas and a satellite dish, also visible in the photographs, and lead us to a northern suburb of Shenzhen. Tiny details as buildings that are not visible in the photographs, but are visible in satellite imagery, and GSM antennas missing in the photographs, but which are visible in street view, show the photographs are at least five years old, likely even older. It takes hours of research, and a complex investigation as this one clearly can not be solved by one person or a small team; a crowdsourced wisdom is required to solve cases like this. When even with crowdsourcing a location or an object can’t be found, it can feel very frustrating. Yet, when a photograph is geolocated or an object is recognized, you realize that there is a chance that the case will be solved and someone will get arrested for a serious crime — and it was you who contributed to that. Research by Daniel Romein and Timmi Allen, editing by Natalia Antonova.